Palm Coast beckons. Trek It Out! 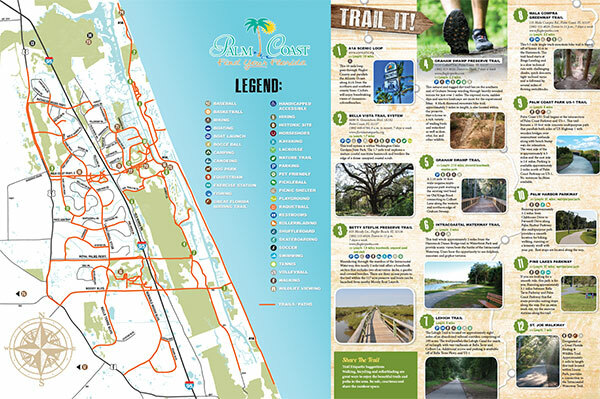 The connecting trails charted on this map will lead you through the splendid elegance of the native Florida landscape. Miles of gradeful pathways are lined with historic oaks, towering pines and indigenous vegetation, taking hikers and bicycle riders on a delightful exploration with family or friends. Trails traverse Palm Coast's most delicate scenery, promising an exhilarating experience that will forever build cherished memories. Palm Coast has four Bicycle Maintenance Stations – at Waterfront Park, Linear Park, the Lehigh Trail trailhead on Belle Terre Parkway and the Graham Swamp trailhead on Old Kings Road – available for use 24 hours a day, seven days a week. The stations have a horizontal, padded post to hang the bike from so bicyclists can rotate the pedals to adjust gears, change a tire or perform other maintenance. A tire pump with a tire pressure gauge is also provided at each station. All necessary tools, including metric sizes, are provided at the station and hang from attached cables inside the main post. A QR Code – which can be scanned using a smart phone – is displayed on the main post to assist bicyclists who need information on how to change a tire, adjust the gears, brakes, etc. Written instructions, as well as videos, are available using the QR Code. This scenic route begins at the parking lot at Waterfront Park and heads north along the Intracoastal Waterway. Cross the wooden bridge and turn right and then make a quick left at the Intracoastal Waterway. Continue north until you get to the Hammock Dunes Trail Head at the bridge and turn left into the trailhead parking lot. Cross Palm Harbor Parkway and turn right onto the walkway along Palm Harbor heading north. Turn left when you come to a fork in the path to double back and head south. Continue south until you get to the intersection of Palm Coast Parkway and Palm Harbor Drive, cross the intersection and get on the Linear Park trail that is in the middle of the median. Follow this trail until it comes to a "tee" with the St. Joe Walkway, and then turn right (west). Follow this trail past Linear Park (rest rooms and water available on the other side of the bridge on the left here), cross Colbert Lane and turn left onto the wooden bridge heading south. Follow this trail until you get to the intersection of Palm Coast Parkway East and Clubhouse Drive and cross Palm Coast Parkway and continue south along Colbert Lane. Continue south until you see Waterfront Park Drive and turn left to enter the park. End at the trailhead parking lot. Waterfront Park Loop (5 miles) - From Waterfront Park (150 Waterfront Park Road, off Colbert Lane), head north along the Intracoastal Waterway, crossing the wooden bridge, to the Hammock Dunes Trail Head at the bridge. This loop begins at the Graham Swamp Trailhead that is on Old Kings Road about 1/2 miles south of the intersection of Oak Trails Boulevard and Old Kings Road. Proceed north from the parking lot and make a right turn just before the canal (only way to turn). Proceed east until you cross a green metal bridge and turn right (do not go straight-this leads to the Woodlands Subdivision). Follow this trail until you get to Colbert Lane and turn right and follow this trail until you get to the entrance to Creekside Subdivision. Turn left and cross Colbert Lane and then make a left onto a shell pathway just before you enter the subdivision. Follow this shell pathway along the creek until you get to Waterfront Park Drive and turn left (if you turn right it is a short way to restrooms and water at the park if you need it). Follow this road out of the park and cross Colbert Lane again and turn right. Continue along Colbert Lane, passing the point where you came out of the swamp trail and turn left onto Blare Drive (no sidewalk along this road, but it is lightly traveled by cars). Stay on Blare Drive until you get to Black Alder Drive and turn left. Follow this road (it bends left, and then makes a 90 degree turn to the right) and intersects with Oak Trails Boulevard. Turn Left onto Oak Trails Boulevard which will shortly end and continue as a shell trail, cross a metal bridge and turn right. Continue straight through the trails "tee intersection" and cross the green metal bridge. Follow the trail back to the trailhead on Old Kings Road. Begin at the parking lot at the Community Center located at the southwest corner of Palm Coast Parkway West and Clubhouse Drive. As you leave the parking lot, cross Clubhouse Drive and turn right. Cross the entrance to the Fire Station parking lot and another entrance drive for some commercial businesses. Go under the Linear Park wooden sign and continue east on the St. Joe's Walkway until you get to the Intracoastal Waterway and then turn left. Continue north until you get to the Hammock Dunes Bridge Trailhead and then turn left into the parking lot. Continue through the lot, cross Palm Harbor Parkway and turn left. Follow this trail until you get to the intersection of Palm Harbor Parkway and Palm Coast Parkway and turn left to cross Palm Harbor Parkway, and then turn right to cross Palm Coast Parkway to the median. Go left under the Linear Park wooden sign and follow the trail until it comes to a "tee" with the St. Joe Walkway, then turn right (west). Follow this trail past Linear Park (rest rooms and water available on the other side of the bridge on the left here). Continue west along St. Joe Walkway until you get to the Community Center again.